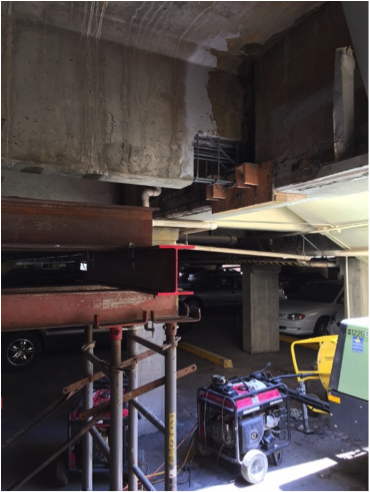 A multi-level precast parking garage in Scottsdale, Arizona required repairs due concrete deterioration and rebar corrosion. Gervasio & Associates collaborated with Restruction to mediate and direct the proper repairs and perform inspections throughout our repair process. The project was finalized after Gervasio & Associates approved of all the completed repairs and procedures. 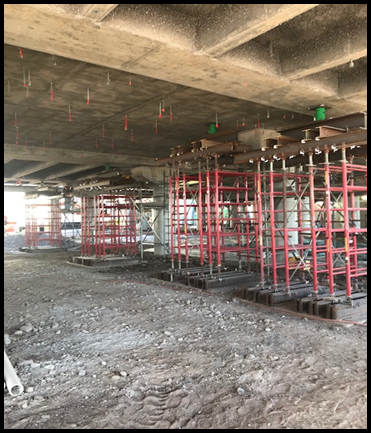 Erection of shoring towers under precast single tee stems and girder beams at various locations throughout the parking structure. The tee stems required a shore load of 2200 plf (pounds per linear foot) and the girder beams required a shore load of 1230 plf. 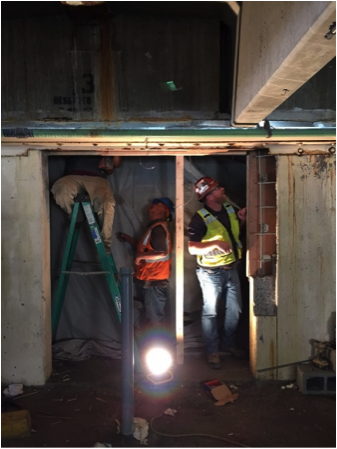 The stamped shoring design is provided by an Arizona Shoring Engineer per Gervasio & Associates structural repair requirements. 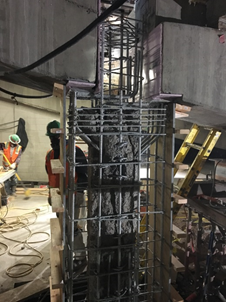 Hydraulic jacking of the precast single tee stems and girder beams overhead to relieve the column corbels of the dead load. This was required to perform the repairs on the columns and corbels that sustained water damage and corrosion. Hydro-demolition of the concrete columns and corbels once the tee stems and girder beams are supported with hydraulic jacks. Concrete demolition of a structural lid in a transformer room. The lid required shoring prior to concrete excavation. 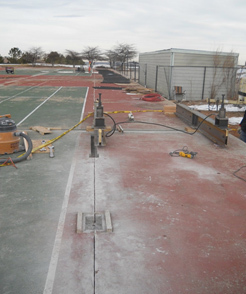 Waterproof coating is applied over the top of the lid once concrete repairs are completed. Concrete repairs to damaged tee stems and girder beam pockets for the tee stems. Concrete repairs to shear walls. The shear walls expanded due to environmental conditions and majorly corroded rebar. 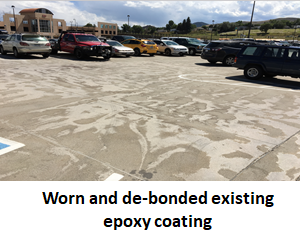 The conditions were most likely caused by freezing and thawing of water inside the concrete pore structure, causing spalling and damage. Concrete galvanic anodes are employed to fortify the structure in all of the repair cavities. The anodes provides corrosion control to the adjacent reinforcing steel by corroding preferentially by a hydrophilic coating. 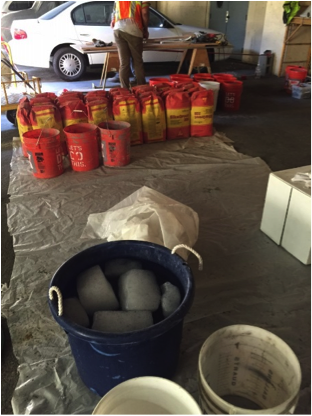 The concrete is placed back by hand pumping structural grouting (Sika 328) until all the forms are completely full. Aggregate is pre-placed into the forms and witness holes are used to assure the flow of the repair material in order to elude any voids from forming. In a few areas the asphalt around a column requires removal to access the entire structural repair. Once the column repair was complete the asphalt was patched back. The concrete requires curing for 7 days in order to maximize the effectiveness of its tensile strength. 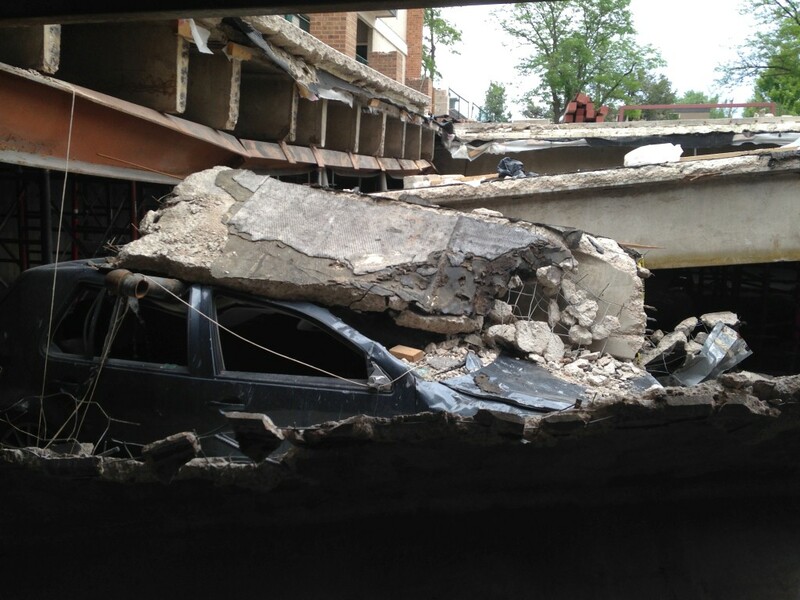 Our shoring remained in place for 7 days to maintain form and function of the parking garage. Once the 7 days passed the jacks were relieved and the tee stems and girder beams were brought back down to their original positions. Restruction Corporation tracked all quantities and overages throughout the project and presented the client with an updated spreadsheet at the end of each week. A reviewal process is important to both the client and engineer, and approving any modifications to the repair phases before changes are affected is essential for a satisfactory result. This is to ensure workflows remain directed and controlled towards the end of the project. The reviewal process ensures that the clients are aware of any changes to the structural repair process before the process is modified. With documentation for quantities and changes to the project’s specifications, there are no issues approving the quantities and moving forward. The client is very respectable and responsive throughout the entire project which helped this project run smoothly. The original contract amount of $127,007.26 increased to $147,497.72 after all the changes to the scope were reviewed and approved. The additional change order work increased the original contract amount by $20,490.46. The team over at the Scottsdale Shadows Condominiums was very pleased with our work once the final punch list and walkthrough was performed with Gervasio & Associates. 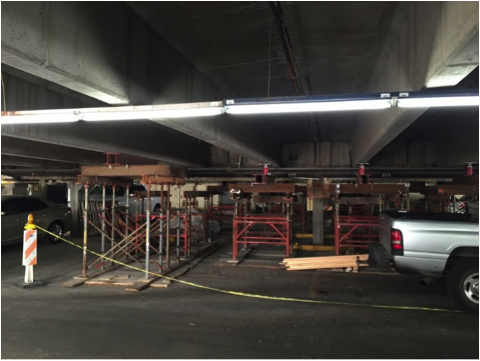 If you have a parking structure in need of comprehensive concrete repair, or similar project needs, contact Restruction and correspond with one of our qualified project managers.